En este artículo se categorizan los distintos tipos de acosos existentes, se proporcionan estadísticas de los últimos estudios sobre los mismos y sus consecuencias así como cifras sobre un estudio particular en nuestro propio IES (Laguna de Joatzel – Getafe). También y desde un punto de vista didáctico se proporcionan juegos y estrategias para intentar reducir los casos existentes y se habla de los nuevos sistemas educativos tales como Kiva que reconducen tales comportamientos. There is a bathroom with a student hidden inside. He is waiting up to the moment when the science teacher arrived to the classroom. It is the only solution in order to prevent from blows, insults and other embarrassing situations among his classmates. Some bullies are knocking on the door, they know he is there and they want to try a new hoax on him, maybe something related to his clothes…. Fortunately, now it is time to attend the class and for a while he can relax but in the meantime some other guys are passing messages including future plans for the end of the class. He could be any one of us, he could be one of our sons or daughters because bullying has a very intimate relationship with the high school, university or even the army. No matter if you are fat, bold, supremely talented or an unintelligent person. It depends on your social abilities, your luck when choosing friends or the kind of mistakes you made in a group. On the other hand something is changing in our society. According to an article in “El País”, silence is no longer a constant in cases of bullying at school. More than half of the harassed and their friends confront bullies, who usually work in groups of two to five people. The effected victims (and also those who harass them) are more and more young and all of them are increasing violent behaviors. The authors of the latest report on bullying indicate that there is a growing awareness that harassment is not "a thing of kids" and, at the same time, more serious cases have been detected. However new technologies such as social networks, smartphones or instant messaging tend to increase these behaviors. Whatsapp, Instagram, Twitter and other media cover up the emotional pressure that some teenagers are suffering day after day. In addition, some shy people take advantage of the network and follow bad leaders to target others when they really are completely unable to do it in the real world. One of every four cases of harassment contained in the report of Anar Foundation is of cyberbullying. It often occurs through mobile phones and social networks and happens any time during the day.. In these cases, the majority of the victims are women, according to the report. The average age is 13.5 years old. There are three types of harassment on the internet: cyberstalking, sexual cyberharassment and cyberbullying. The first refers to harassment between adults "in the strict sense", while sexual cyberharassment "has to be patent sexual order of comments". Finally, the cyberbullying implies that harassment occurs among children. The definition of harassment, is to repeat any of the following behaviors: persecution and search for proximity of the victim, the intention to establish contact with her/him, the misuse of personal data or threatening freedom. Cyberbullying is criminal offence which can result in imprisonment, with penalties of imprisonment of three months to two years, or a fine of six to 24 months. 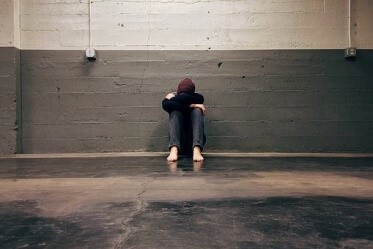 If the perpetrator harasses a particularly vulnerable person by reason of age, illness or situation, they shall be liable to imprisonment of six months to two years and there will be no fine. In the event that the victim and bully have been romantically involved (whether with or without cohabitation), or when the messages are directed to descendants, ascending or to family members of the ex, a term of imprisonment of one to two years, or tasks shall be in benefit of the community of 60 to 120 days. Lots of campaigns on mass media or new educational systems such as “Kiva” are leading the eternal problem to a new dimension. Harassers are becoming the bad guys instead of funny people who just make practical jokes on the innocent. 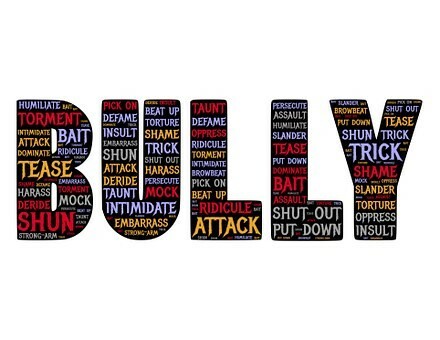 According to recent studies, the vast majority of teachers are decreasing their reactions against bullying. Some of the interviewed docents refer to more confrontations with the parents of the stalkers who deny such behaviors and even denounce teachers to the administration by “bullying” to their children. For instance, Kiva organizes meetings with stalkers and victims and creates comfortable environments to soften their initial positions. Obviously they hardly ever will be good friends but maybe they could forget one another. In the majority of cases the bullying comes not from a person, the bully of the moment, but from a group who exercised it. Nobody does anything very serious, but when done in a group, become quite serious. AWorst of all is that someone might not even be aware they are being a stalker., occurs without you realize, no matter what efforts you've done so that your children know what is bullying and not practice it. Anyone can become, at once, a stalker and not realize. Experience says that there are places, in addition to the immediate vicinity of the school, where bullying occurs most frequently: playgrounds, toilets, locker rooms and gyms, dining rooms and corridors. Hence, according to the Attorney general, it is legitimate to require those responsible for the schools, which have been assigned the Mission of "guardian of the minor" for as long as this happens in school, that those places have the "proper supervision". Unfortunately, "that is not always true... On the contrary, rarely is there a surveillance in places like basins, where there are so many cases of 'bullying' ", denounces Rafael Romero, director of the Andalusian Institute for the prevention of school bullying (IAPAE). We are making sure that the most effective is the mediation between peers or between the peers, both as a preventive measure as to act when already there has been harassment,” explained recently Andrés González Bellido, teacher, Counselor Education, psychologist and coordinator of tutoring between equal (TEI) program, which already has been implanted in more than 8,000 schools in Spain to combat the ‘bullying’ and improve school coexistence. According to a recent survey in our own high school, which was performed among students on A-level, 40% of them assure they have been harassed in the past. Curiously, 40% of the people interviewed refused to answer. On the other hand, 90% of the pupils admit they have seen bullying situations before although they hardly ever noticed or report any of this to a teacher or adult. In fact, almost 62% of our apprentices confess having encouraged bullies sometimes. In addition, the vast majority of young people believe teachers rarely assist or help the victims and maybe this is one of the reasons why they never warn them. It is also observed one evolution in the ages in which stalking occurs with more frequency. 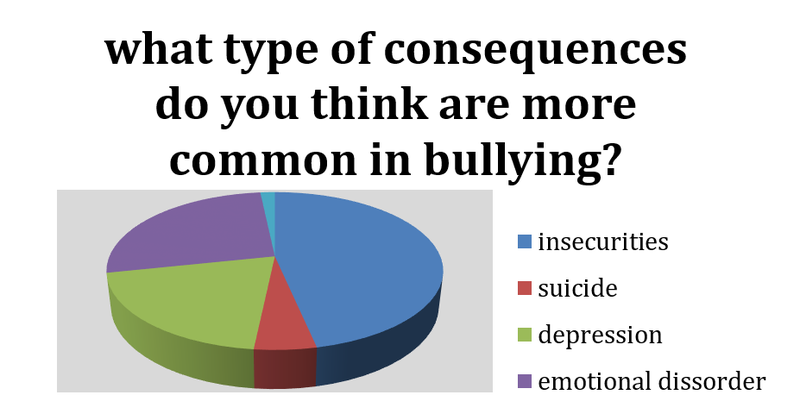 Finally, our students were asked about most common consequences because of the bullying and next graphic shows the results. From a didactic point of view, there are tons of role games, dynamics and activities we could try together with students in order to make them more sensitive to this reality. Many online games designed to entertain and teach children important lessons about bullying flourish on the Internet. McGruff.org Shrink the Cyberbully is a lively game of questions and answers that questioned children about appropriate responses to handle the increasing number of cyber stalkers. Web sites Stop Bullying Now! and PBS Kids also contain animation games evaluating the children’s knowledge of the best ways to “beat the aggressor”. Other games, such as the game of rage that is described on the web site Education World, allow children to explore feelings of anger and frustration. A child puts on a costume or old coat and should represent the way in which anger looks, sounds and feels. Teachers or parents encourage the child to fully examine the emotion of anger in the stalker and the aim of this during a period of conflict. The child will discuss how to face and resolve situations of bullying and anger associated with it. Ask a Cop website suggests the boys together in band to create The “Swarm” when they witness bullying incidents. Children practice to copy the behavior of a swarm of bees, move together as a group going from the hive to a stalker and its aim is to be the victim and calm the situation. The website says that the people who “try to intimidate others with words or cruel actions crumble when faced with a force bigger than yours”. Las víctimas de acoso escolar rompen su silencio. Pilar Alvarez. El pais (27-4-2017). Lo peor del bullying ocurre sin que te des cuenta. El español (16-2-2018). El acoso escolar, un fenómeno que preocupa a los fiscales. El periódico. Maria Jesús Ibañez (02-03-2018). ¿Qué pueden hacer las escuelas ante un caso de acoso?. El periódico. M. Jesús Ibañez (02-03-2018). Qué es el acoso en internet y cuándo es delito. El periódico. Marcos Calvo (13-02-2018).